During his Last Supper, Jesus used the Passover to help communicate the meaning of his death. Apart from Christ’s atoning death, all of us sinners deserve the deadly judgment that came upon the Egyptians—and worse, hell itself. The good news is that God sent his very self—Jesus, God the Son—to be our substitutionary sacrifice—our Passover lamb. I was at home last Thursday afternoon when my son Townshend rushed in to tell me that Georgia State was making a game of it against the heavily favored Baylor in the opening round of the NCAA men’s basketball tournament. How is that possible? A 14-seed versus a three-seed? As you probably heard, Georgia State won the game. They were down by two with seconds left, when R.J. Hunter sank a very long three-pointer to put GSU over the top. A big upset! And the upsets continue. Yesterday, I saw the eight-seed N.C. State defeat number-one seed Villanova. 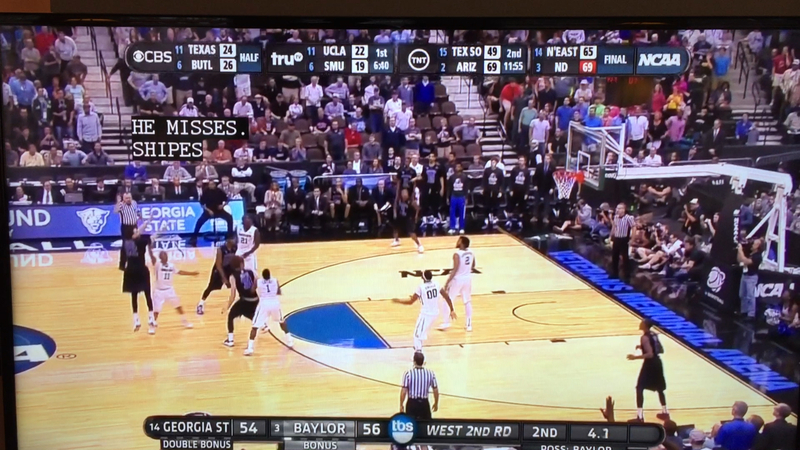 And this is why we love March Madness—because unexpected, even shocking victories can take place. In today’s scripture, on this night of Jesus’ arrest by the temple guard, hours before he’s handed over to the Romans for his trial, his beating, his scourging, his mocking, followed by his crucifixion, Jesus is working on the biggest upset victory in history—a victory no one would have predicted. 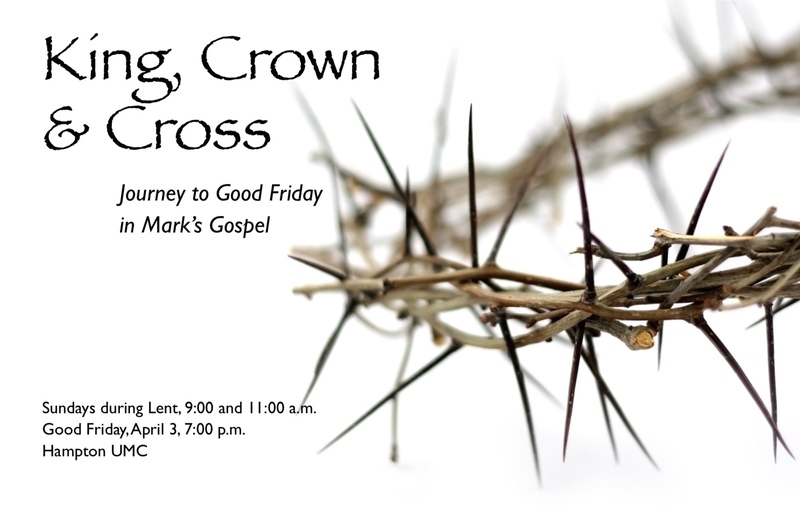 Everyone, including his closest friends and disciples, were caught off guard—first by Good Friday and then, especially, by Easter Sunday. The fact that Jesus chose this occasion of Passover for his Last Supper tells us a great deal about the meaning of his death. The Passover meal commemorates the main event that led to Israel’s liberation from slavery in Egypt. God sent a series of nine plagues against Egypt. Each time, God gave Pharaoh a chance to repent and set Israel free, and each time Pharaoh refused. Finally, on the night of Passover, God sent a tenth and final plague: the Lord would pass through all of Egypt, killing every firstborn child in every household, either Egyptian or Israelite. The only ones spared would be those Israelites who slaughtered a lamb and put its blood on the doorposts. While I was preparing this sermon, I reviewed the Passover event in Exodus 11 and 12. And I wrestled with a question that never occurred to me before. And I want you to wrestle with it too: If the Passover was God’s judgment against the Pharaoh and Egypt for enslaving, abusing, mistreating God’s people Israel, why did Israel also come under this same judgment? I mean, if God wanted to punish Egypt for its sin, why couldn’t he just do that? Why require Israel to slaughter a lamb and sprinkle its blood on the doorposts? Israel wasn’t guilty—only Pharaoh and the Egyptians, right? Wrong! If God is going to judge people for their sins, everyone falls under that judgment! What happens to the firstborn of Egypt in the Passover is what everyone deserves, including God’s people Israel. Because of our sins, we all deserve God’s judgment and God’s wrath! Most of us struggle with this idea. You’ll recall last month, many Georgians, including some of my United Methodist clergy colleagues, were protesting the scheduled execution of Kelly Gissendaner. She’s facing execution for her role in her husband’s murder. These protesters were signing petitions. Some of them were picketing at the prison in Jackson. And many of them were trying to make their case against the execution by pointing out how Gissendaner had done a one-eighty in prison; she had changed. She was now a Christian. She was now a model inmate. She was now a very different person from the one who conspired to kill her husband in such a brutal fashion. Respectfully, I disagree. Now, please don’t misunderstand me: whether the state should execute her because of her crime or have mercy on her in spite of her crime is a separate question. And there are good, Christian arguments on that side. But if the state does spare Gissendaner’s life, it will only be out of mercy, not because she doesn’t deserve the death penalty. As a Christian, Gissendaner should understand this as much as anyone. “For all have sinned and fall short of the glory of God.” And “the wages of sin is… death.” The truth is, all of us, whether we commit murder—or whether we commit far more “respectable” less obviously destructive sins—we all face the death penalty. The Bible says it’s a penalty imposed by God for our sin. And we will all face judgment for our sins. And the only thing that will spare us from the ultimate penalty—which isn’t only death but, rather, eternal separation from God in hell—the only thing that will save us from that, is God’s great mercy. If we think otherwise, I wonder if we’ve really come to grips with the sin that’s inside of us? Have we come to grips with how utterly sinful we are? 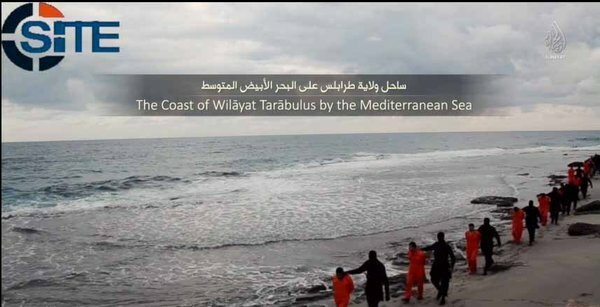 On Sunday mornings, I enthusiastically celebrate the fact that grace and forgiveness has been extended to someone like me who doesn’t deserve it, but on days like this [when ISIS beheaded those 21 Egyptian Christians] the idea of that same grace and forgiveness being extended to such villains is incomprehensible to me. He went on to say that in the face of such great evil, he really has a hard time with the gospel. Frankly, I have a hard time with the “hard time” that Zack Hunt has with the gospel: First, he says it’s incomprehensible that God could forgive these killers. O.K. But why doesn’t he also find it incomprehensible that God could forgive him? I don’t have to imagine that my sins are as bad or worse than these cold-blooded killers to realize that my sins are bad enough! Jesus knows the anger that’s in my heart, and he warns in the Sermon on the Mount that anger like this is on a spectrum that leads to murder. My sins are bad enough! Besides, I like reflecting on the fact that God could extend grace and forgiveness even to these cold-blooded killers because, well, that means that God extends grace and forgiveness to me too! Also, while grace and forgiveness are certainly available to these cold-blooded killers, they need to repent and believe the gospel first. This grace and forgiveness comes only through faith in Christ. But unless or until they do repent and believe, they’ll face God’s judgment and wrath for their sins. More importantly, even if these killers repent of their sins, place their faith in Jesus, and find forgiveness, it won’t be because that forgiveness and grace and mercy is free. It comes at a great cost—someone will pay for it. God the Son, Jesus Christ, the Second Person of the Trinity, was offering to be our once-and-for-all substitutionary sacrifice for our sins! This is what true love looks like! Remember the movie Frozen? It was the story of two sisters. One sister, Queen Elsa, has the magical power of making ice and snow. But she can’t control her power, and out of fear for the safety of others she runs far away from home, far from her loved ones, far away from her kingdom. She’s afraid to be close to anyone out of fear that she’ll harm them. Her fears are well-founded. When her sister, Anna, catches up with her to rescue her, Elsa accidentally strikes Anna with an icy blast to her heart. Because of that blast, Anna will literally turn to solid ice unless she gets the cure—the cure is to be kissed by her true love, Kristoff. In the movie’s climax, she only has a short amount of time to meet Kristoff, who is running toward her. Meanwhile, a short distance away, she sees that her sister Elsa is about to be killed by an enemy’s sword. So Anna has a choice: save her own life by running to Kristoff or save the life of her sister—who, after all, gave her this disease in the first place. What does Anna do? She offers her own life to save the life of her sister. She puts herself in between her sister and the sword intended to strike her sister dead. 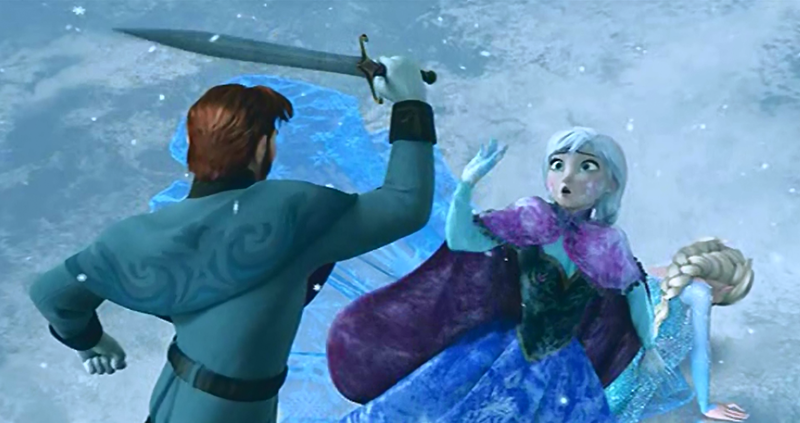 Anna becomes solid ice, breaks her enemy’s sword, and dies in her sister’s place. It’s as if she takes her sister’s icy affliction upon herself—letting herself become ice—so that her sister can be saved. I grew up Baptist, as did many of you. Consequently, I’m well aware that one of the things that divides Baptists and Methodists—well, Baptists and most other Christians—is baptism. We Methodists, alongside most of the universal church, practice infant baptism, by sprinkling, whereas Baptists practice believer’s baptism, by immersion. I was baptized by immersion after I became a believer. So at least I’m saved. I want us to think about the symbolism of infant baptism. The child is completely helpless. She can nothing for herself. She can’t feed herself, clothe herself, change herself. She can’t earn a living. She can’t pay her expenses. She’s completely dependent on other people for her survival: whether she lives or dies depends completely on the grace of her parents—and other people who love and care for her. Not really! Say a man “finds himself in the middle of a vast sea, treading water. There is no land in sight, no boat on the horizon. He is hungry and thirsty and rapidly tiring. He’s headed for death… Then along comes a rescue ship. When the ship gets close, it lets out a raft with three men on board. Rowing over to the desperate man, they stretch their arms out over the edge of the raft and grab him. He grabs their arms as they pull him into the boat. They take him on board the ship, give him medical attention, and get him home. The man is saved. Timothy Keller, Jesus the King (New York: Riverhead Books, 2011), 178-9. This story is adapted from Mark Galli, God Wins (Carol Stream, IL: Tyndale, 2011), 73-74. This entry was posted on	March 31, 2015 at 1:05 pm	and is filed under Uncategorized. Anything other than the blood of Jesus is “cheap grace” indeed. PS: All of our sin. Not just the “big ones”.